The low priced Amazon Kindle Fire has apparently "sparked" some interest in those looking to buy a low-priced tablet. After the first day of being up for pre-orders, 95,000 units of the 7 inch tablet have been reserved. Priced at $199.99, the Amazon Kindle Fire is priced $300 lower than the cheapest model of the Apple iPad 2 and is expected to be launched on November 15th, as we reported. Amazon is allegedly taking a $10 loss on each tablet sold, based on a breakdown of the components of the tablet. However, after selling content, apps and clooud-based services to Kindle Fire owners, Amazon is expected to walk away with a $10 profit for each tablet it sells. According to an estimate produced by Forrester Research, Amazon should sell 3 million Kindle Fire tablets by the end of the year. Despite the difference in screen size, the 10 inch Apple iPad 2 is expected to be affected by the lower price of Amazon's device. The original Apple iPad had 300,000 units reserved after its first day being available for pre-orders, and Apple has sold approximately 29 million tablets since the first one was bought in April 2010. Other 7 inch tablets, like the BlackBerry PlayBook and the HTC Flyer have recently been cut in price by some retailers, most likely to match the price of Amazon's offering. 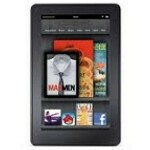 With the November 15th launch date, the Amazon Kindle Fire should be available for the holidays. Brian Dunn, CEO of Best Buy, said he expects the Amazon Kindle Fire to be one of the hottest gifts for the holiday season which officially begins the day after Thanksgiving.